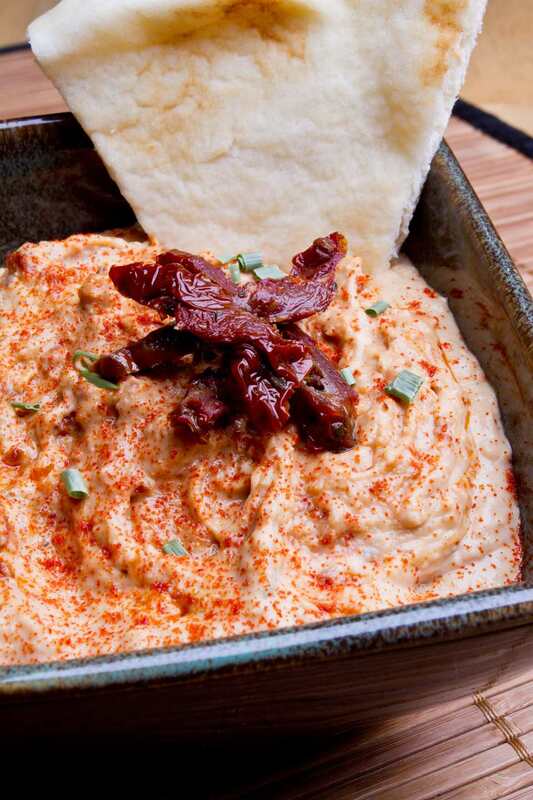 Adding sun-dried tomatoes to a homemade hummus recipe adds a bit of texture and color and a whole lot of flavor. Making homemade hummus is so easy―just dump everything in the blender or food processor, and process until it's smooth. Hummus is a naturally vegetarian, vegan, and gluten-free food. Process all ingredients in a food processor or blender until smooth, adding more liquid if needed. That's it! Enjoy your homemade hummus. If you prefer, you can also add the sun-dried tomatoes last, and process the hummus until the tomatoes are finely diced rather than completely smooth. This will give your hummus a bit of extra texture if you prefer. If your blender isn't strong enough to handle the sun-dried tomatoes, you may need to give them a quick coarse chop.